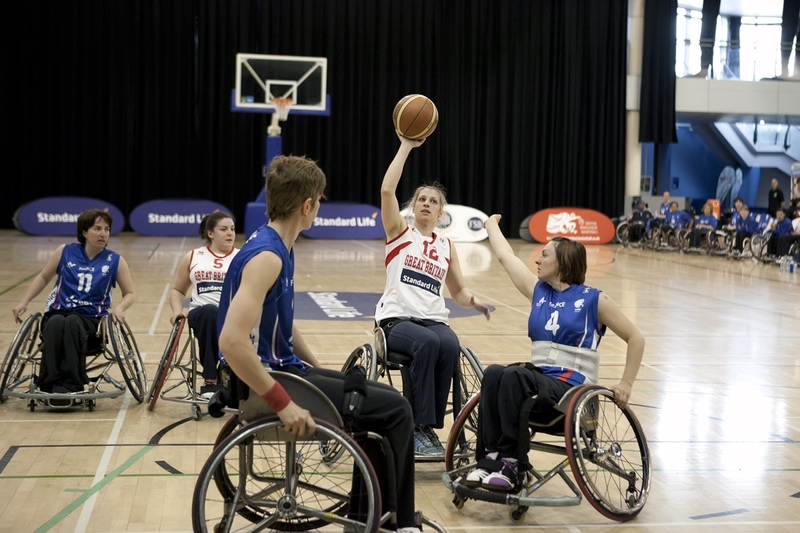 “I’m hoping that I may have time to tour the Olympic Park in my downtime,” says Helen.This may seem an odd thing for an Olympic athlete to say, but Helen’s event, Wheelchair Basketball, will be held in the O2 Arena. Free time for an athlete is scarce added to which high levels of security result in little time for sightseeing. 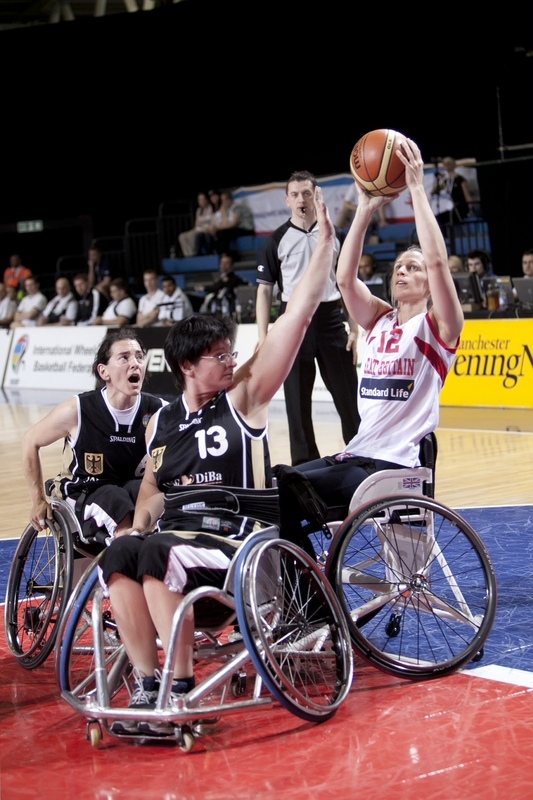 Helen Turner is one of Team GB’s Wheelchair Basketball team and this will be her third Olympic Games. The women’s team is ranked 6 in the world and has at some point beaten each of the ten nations that have qualified for London 2012. Sio the competition is evenly balanced and bound to be exciting. Helen, whose disability following a back injury is rated at 3.5 explained that there has to be a disability points total of 14 on court at any one time. This means that the coaches and managers have to be competent mathematicians as well as master strategists. In national league matches as opposed to International competition, able bodied athletes may be found playing in the team, but even then their points count of 5 makes them very expensive to team strategy. Also, as Helen points out, they are often no more able to deal with the specifics of this sport and often far less adept with the wheelchairs. Effectively Helen has been in constant training for the last 12 years, though the preparation for London has been more stringent than ever. “It’s my job,” she tells me. For the past four years she has kept an online journal of her training and followed a strict plan of tasks and activities, as well as diet. She has been supported by nutritionists, physiotherapists, psychologists, sports scientists, in addition to her coaches for skill and fitness. Between now and her arrival in the Olympic Village on 27th August, Helen has a full schedule of matches as well as training commitments each day, though the the day approaches her skills training will ease whereas her fitness training will not taper at all. Once in residence she will share a room with six other members of her team and will be subject to a strict curfew and her contact with the press and the outside world will be fiercely protected. The one advantage is the 24/7 food hall offering truly global cuisine to cater for athletes from every corner of the globe and with every imaginable dietary requirements. Helen’s room will be decorated with the posters wishing Good Luck that were made for her by pupils of St Lawrence School in Chobham, her home village. Pride of place will go to the one made by her son, Luke. Her family (including grandparents who have been so supportive with child minding and long suffering husband) all have tickets that they have bought in order to watch her matches, though Luke is a little concerned that he may find it ‘boring’! I can understand the family bit but had no idea that even when training in the gym, team GB athletes wear team GB strip. Helen went on to explain that it is much like being in the army in that life is totally regimented…even to the extent that counselling is available to help athletes return to ‘civvie street’. I imagine that Helen’s young son and close family will help her make a smooth adjustment and also find just the right way to celebrate her 2012 success. This entry was posted in BT Olympic Storyteller, Chobham, Family, London 2012, Surrey, Team GB, Uncategorized, Wheelchair Basketball, writer, writing and tagged 2012 Summer Olympics, BT Olympic Storyteller 2012, London, Olympic, Olympic Games, Online Writing, Paralympic Games, poetry. writer, Wheelchair Basketball, writer. Bookmark the permalink. Just sat down to read this- very interesting insight into the life of an Olympic athlete. What fantastic dedication. I was most intrigued by the disability points score that the team as a whole needs to adhere to! Must present some tricky elisions if anyone needs to be substituted during a match….